The finest collection of Italian luxury pool tables from Longoni. Beautifully stylish designs, handmade by skilled craftsmen. Free delivery and installation. Finance available subject to status. Longoni Pool Tables are manufactured in Italy, and are some of the most beautiful pool tables in the world, which make them the highlight of any home. Here at Home Leisure Direct, we are incredibly proud to be an Official Longoni Retailer in the UK. The Longoni range of tables is incredibly popular. The modern, stylish Italian design gives their range of tables a distinct look. Longoni have two ranges - firstly, those designed for the discerning home customer, looking for a high-end pool table, which plays superbly and looks fabulous. The other range is designed for commercial use - these pool tables share the same good looks but are also built robustly for use in a variety of commercial environments. Longoni's beautiful range of pool tables is ideal for customers who want the very best in luxury home pool table design and gameplay. 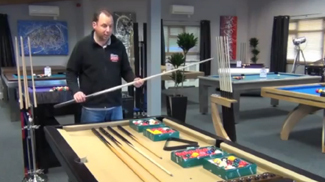 Longoni's pool tables are flexible to the customers requirements. A wide range of options of materials and cloth are available, along with pool dining table tops and carom conversion kits. This allows you to personalise your table to suit your décor, instead of compromising on style. A variety of finishes is available across the Longoni range, to help you find that perfect look. Longoni tables come fitted with Simonis cloth as standard, in a choice of more than 20 colours. The sheer quality of Simonis cloth gives it a long life and a high-quality playing surface, as well as enhancing the look of your table with its range of beautiful colours. If you still can't find quite the right colour for you in Simonis' range, however, we can also fit logo cloth to represent your favourite football team, Jack Daniel's, or any company logo you choose. We have exclusive licensing deals with Jack Daniel's and many of the top football teams, and can also apply your own design to really make your new Longoni table your own. We have a Longoni Elegant on display in our showroom, so if you're keen to see the quality of finish for yourself, please pay us a visit. Our showroom model is finished in Black, fitted with Gold cloth. Seeing one of Longoni's tables in person will allow you to get a real feel for the quality of their craftsmanship. At Home Leisure Direct we supply your Longoni table with free delivery and installation to most locations within mainland UK. The table will be professionally handled by one of our fully insured specialist two man delivery teams. It will be placed in a ground floor room of your choice, and all packaging removed. This ensures you have the best service from Longoni and Home Leisure Direct, from the moment you order to the start of your first game. If you are looking for some expert advice, either on Longoni Pool Tables or on any of our other products, please just give our friendly team of advisors a call on either our freephone number 0800 622 6464, or on our main line number 01454 413636.